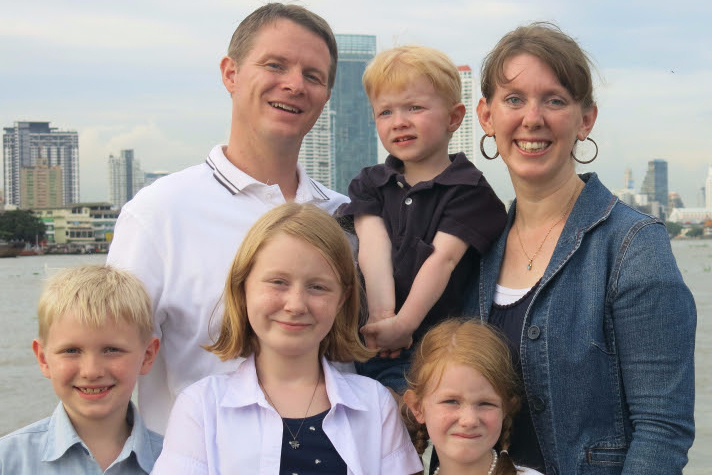 Duane and Hannah Scott are missionaries in Bangkok, Thailand, serving with Baptist Mid-Missions and sent from Family Baptist Church in Minneapolis, Minnesota. The Scotts have been in Thailand since June 2006. Bangkok is a huge city filled with all kinds of interesting things and friendly people, but many know very little about God and the hope of salvation through the gospel of Jesus Christ. Since 2009, the Scotts have been working with BMM co-workers on the western side of Bangkok in an area known as Pinklao (pronounced “Pin klow”). Pinklao Baptist Church was organized in September 2014. The Scott’s regular ministries involve teaching English at the church, ministering at the local prison ministry to both men and women, and teaching in a small Bible school in the area. Duane and Hannah were married in 2002, just after Duane graduated from Central Baptist Seminary in Minneapolis, and Hannah graduated from Northland Baptist Bible College in Wisconsin. The Scotts are blessed with four children: Elaine, David, Autumn, and Benjamin. Find the Scotts on Facebook here.